The retreat was an excellent time away. Bishop James was fantastic in his teaching, which was based around 2 Corinthian chapters 2 – 6., and challenge. A really powerful time for me personally was on the last morning when in the context of a Eucharist, Bishop James prayed for each of us and then anointed us as we re-affirmed our ordination vows. This experience took me back to the roots of why I do what I do which was in itself a real personal challenge to me. The most encouraging moment for me came when Bishop James reminded us that we hold our treasure, our ministry, within jars of clay (2 Cor 4:7-12). These jars are jars that would be picked up at a local market, poor quality, thin, designed for everyday use … maybe even cracked. These are not the good quality thick earthenware jugs that would be adorned with patterns and motifs. 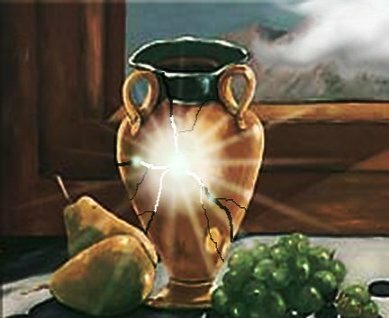 The bishop pointed out that Paul states figuratively that it is in these everyday poor quality clay jars that we carry the message of the gospel in. Paul was saying, and the bishop was reminding us, that Paul likens our lives to those poor quality jars. Jars made so thinly that you could see a candle shining through them. That encourages me because a lot of the time I feel broken but don’t feel the need to be fixed, even though people sometimes want to fix me. It encourages me because I know I am full of cracks and imperfections, but don’t feel a need to fill or glue them with something else, even though some may feel thats the right thing to do. It encourages because I know I ain’t one of those pretty jars …. but God created me in the image of God all the same. I’m encouraged because I have believed for some time that that my being broken and cracked and transparent is right. I believe this because I think that it may be through the cracks, the thin-ness and the transparency that the light of Christ shines through. If I was perfect and my life was solid and sealed nothing would escape or leak of seep out from the imperfections. So …. I remain deliberately cracked because I believe I was deliberately created that way. This entry was posted in life, ministry, mission by robryan65. Bookmark the permalink.